Captain George Henderson was the proprietor of the Memory Lane nostalgia shop on 594 Markham Street, Toronto. He "had excessive facial hair, a twinkle in his eye and a desire to provide anyone who entered his shop with their most desired item." as one fan wrote on her blog. Henderson was also one of the earliest kings of the comic strip reprint business until King Features took him to court and put him out of the business. 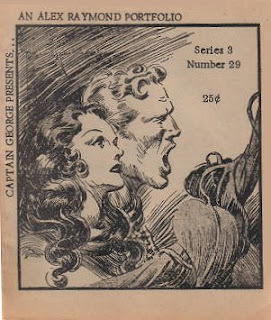 Henderson was apparently unaware that Alex Raymond's work was still under copyright. His piracies cost him from 4,000 to 10,000 dollars in fines, sources disagree on the exact amount. "At 39 he is Canada's King of Camp and an ardent comicollector (sic) who got that way by chance three years ago, when he whimsically decorated his book-store with old comic books he had found in his sister's basement. "A man came in and picked up a Batman from the display and peeled off five $20 bills from his money clip. I immediately closed the store and went down to the States to find out what the business was all about." Now he's selling 15,000 used comic books a month, including surprising quantities to newly hooked youngsters." 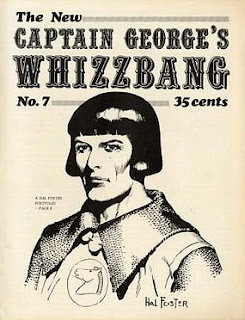 Captain George had a worldwide reputation with his various reprints selling for for 25 cents in Canada, the US and Europe. his international reputation was not surprising, few people had ever seen the comic strips Little Nemo or Krazy Kat, they seemed to be irrevocably lost to history. Hell, most boomers had never even seen a Captain Marvel comic book. Titled: 'The Magic of Winsor McCay'. Titled: 'Krazy Kat by George Herriman'. Huib also noted that "at least 29 issues of COMIC WORLD were published. 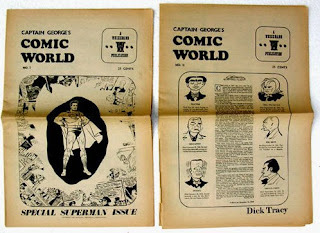 From issue 5 it was titled: CAPTAIN GEORGE'S COMIC WORLD." In this CBC television clip from May 20, 1970, Captain George discusses his store and the emergent hobby of comic collecting. *1994. Essay RG. Het fenomeen Hergé, Huib van Opstal, Hilversum: Delange. I started collecting comics in 1966 when the Batman show became so popular. I first found out about Captain George in 1970 with his advertising in American fanzines that I subscribed to. In 1973 when I was in my young teens I finally got to visit his store in Toronto. I bought a few comics and some copies of his fanzines.He was very friendly to an "out-of-towner" and even posed for a photo I took! Thirty-two years later I revisited Markham street and reflected back on those "good old days" .It was a good time to be a comic book collector in Canada. My father's antique store was next door to memory lane, I knew him well when I was a kid. Can still see the "revenge of the Jedi" poster he put up one day which probably sold for $20. I had a poster from the flash Gordon movie as a birthday gift one time. He was more focused on posters at that point but I still remember buying comics there and back issues of whizbang on the counter. I used to go and see George every Friday back in the '80s. He was a terrific guy, with loads of stories. I bought a LOT of posters from his Memory Lane shop. They all smell of smoke, as George was a keen cigarette smoker. Someone should write a book about him.